The Doctor, Amy and Rory travel to the planet Apalapucia the second best destination for the discerning intergalactic travellers. Arriving on Apalapucia they find that the whole planet has been put under quarantine and the disease called Chen7 could kill the Doctor in a day. 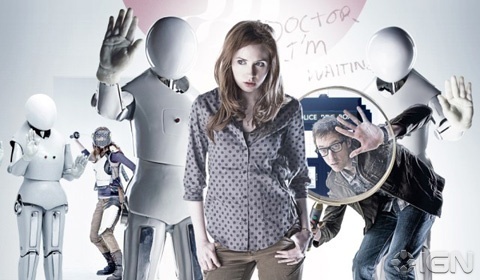 Amy gets separated from the Doctor and Rory and is put into a faster time stream. It’s up to Rory to save his wife before she is killed by kindness. This story by Tom McRae (Rise of the Cybermen, The Age of Steel) is morally a very interesting story about Rory’s struggle to choose which wife he really wants. The choice is between “his” Amy or the much older Amy who can look after herself. McRae emphasises this point by giving Amy her own Sonic Screwdriver. This is the first “Doctor light” episode of the Matt Smith era. I am not a fan of “Doctor light“ episodes but McRae has done an excellent job really playing to the strengths of the characters and their situation. The acting is brilliant, especially Karen Gillian who really shows her acting credentials as the older warrior like Amy. Both Arthur Darvill and Matt Smith are very good but it really is Gillian who steals the show. The directing is great. The way the slow fight sequence is filmed is fantastic. The whole sequence is so well shot it really works better than if the sequence had been shot at a normal speed. In summary, it is a great episode with fantastic acting, writing and direction. Tom McRae should defiantly be back for Series Seven.